Okay, using a program called "Notability" for taking notes now. 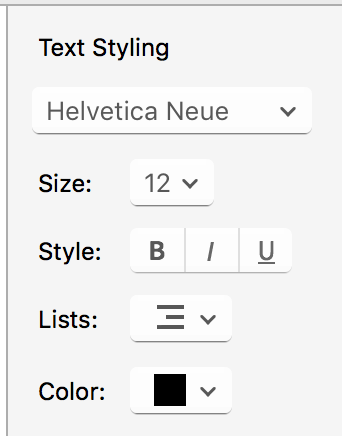 I would like to create a shortcut for changing text colors, etc. However, I'm having trouble scripting the UI. The changing colors is not in the menu bar (otherwise it would be a piece of cake). I'm trying to click on the color selection (see image below), but I'm getting an error. Not sure what exactly it means. static text "Am Pol Theory"
static text "5 product inclusion Aug 6, 2018"
static text "Today at 3:04 PM"
static text "4 Tech&Culture Aug 6, 2018 (2)"
static text "Today at 1:59 PM"
static text "1 Note Aug 6, 2018"
static text "Today at 1:37 PM"
static text "2 Keynote Note Aug 6, 2018 (2)"
static text "3 Who is google Note Aug 6, 2018"
Browse other questions tagged applescript ui .